In my quest to expand my taste buds beyond chicken, I found this fabulous flank steak marinade from Clean Eating magazine. You have to try it and let me know your thoughts! My husband and I loved it! 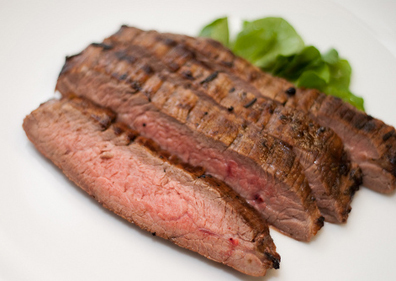 Flank Steak is an economical and lean meat. It is not as tender as other cuts of meat, so I would recommend marinating overnight for the best flavor. 3 teaspoon olive oil, divided. Place both steak halves in a Zip Lock bag. In a small bowl, combine lime juice, garlic, parsley (or cilantro), cumin, paprika, cayenne pepper, and 2 tsp olive oil. Pour the mixture into the bag and thoroughly coat steak halves. Refrigerate for at least 2 hours; however, I would recommend refrigerating overnight. Heat the remaining 1 tsp of olive oil in a cast iron grill pan on medium high. Add steak, 1 at a time, and cook for 2 to 3 minutes per side (for medium-rare). We cooked on a gas grill and it still tasted great! Remove the steak from the pan and cover loosely with foil for about 3 minutes to let the juices soak in. Before serving, slice the grain into 1/4 inch slices.